When Walt Disney World was looking for an architect to design the Yacht Club, they found the perfect candidate in noted architect, Robert A. M. Stern. 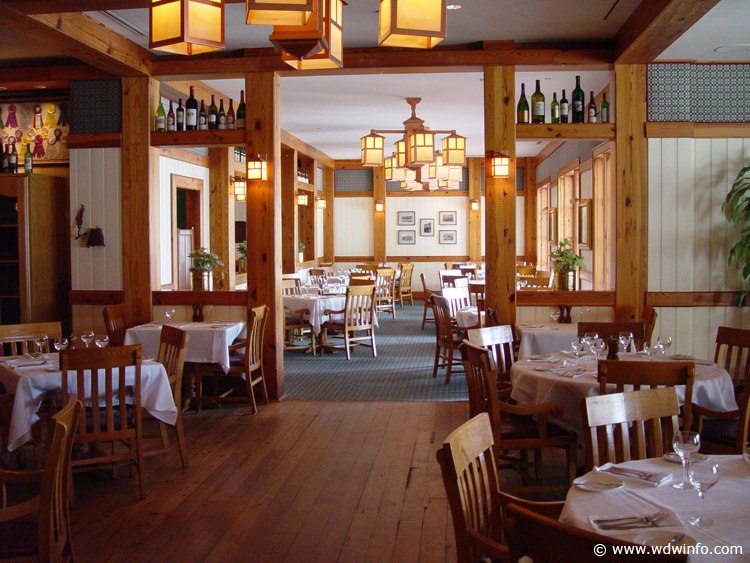 Stern was known for his designs of East Coast seaside homes and he brought his expertise of the New England seashore hotels of the late 1800’s to the Yacht Club. Unlike the casual atmosphere of its sister resort, the Beach Club, the Yacht Club has more of a quiet, understated elegance about it. This sophistication is found in the dark hardwood floors, leather couches and antique chandeliers of the lobby. The nautical theme is enhanced with brass fixtures and rich millwork. The exterior of the stately Yacht Club is of gray and white clapboard. 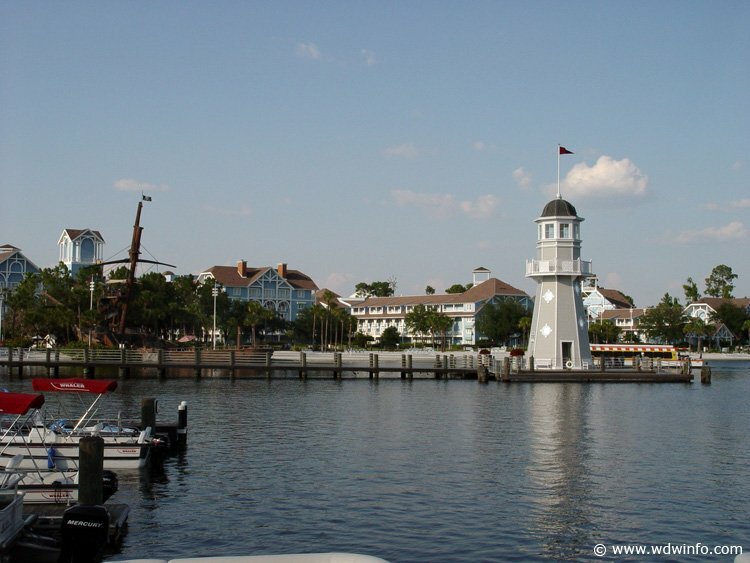 The East Coast seaside theme is prominent in this area with a lighthouse at the end of the Yacht and Beach Club dock and the Boardwalk that circles Crescent Lake. 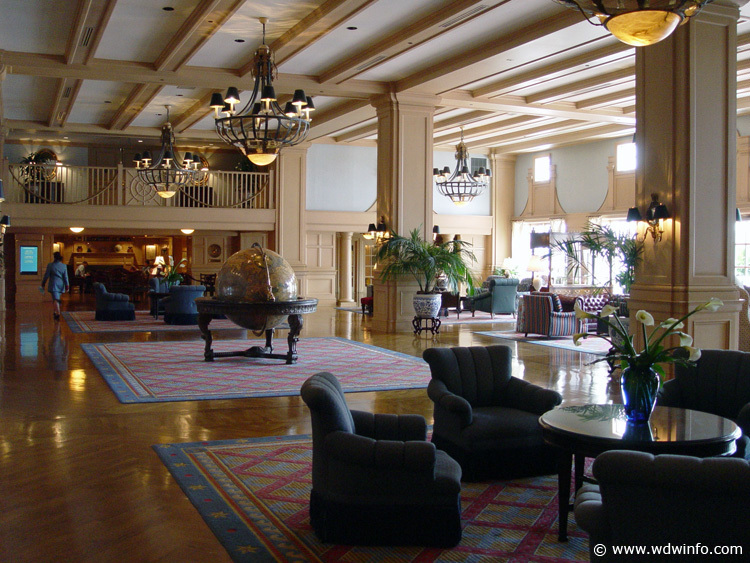 The Yacht Club has 630 rooms with an average room size of 380 square feet. To further enhance the nautical theme, these rooms are decorated with white furniture and blue carpeting and bedspreads, with ship’s wheel motifs on the headboards of the bed. In a guest room, you’ll find 2 queen sized beds, or one king sized bed, a table, 3 chairs, refrigerator, coffeemaker, an armoire, a TV, a small safe and double marble sinks, in a vanity area separate from the tub and commode. Some rooms may include a daybed as well. French doors lead out to the spacious balconies or patios. There are 10 handicap accessible rooms here. There are currently 9 reviews for Yacht Club Resort. Read Full Yacht Club Resort Reviews! You can also search for Disney’s Yacht Club Resort specific threads! There are 20 suites and 71 concierge suites for those who prefer a little luxury with their vacation. Some of the suites include a lavishly furnished sitting room area and separate bedroom with a king sized bed. The large bathroom includes a Jacuzzi tub, a vanity area, a television and a walk-in shower. Concierge suites are all located on the fifth floor, which is only accessible with a private key-card. The regular concierge suite is very much like a regular guest room with respect to size and furnishings. But concierge amenities include television speakers in the bathroom, robes, a hairdryer, makeup mirror, and a nightly deluxe turndown service. Concierge service includes use of the concierge lounge and concierge staff for private check-in and check-out, to make dining Priority Seatings, plan outings, answering questions, ticket purchases, transportation arrangements, and filling requests for special dining or accommodation needs. The concierge lounge is also found on the fifth floor. Here you’ll find a complimentary continental breakfast from 7 a.m. to 10 a.m. From 10 a.m. until 3 p.m., you can watch a Disney video and munch on cookies and milk. A wine and cheese bar is available between 5 p.m. and 7 p.m. And from 7 p.m. to 9 p.m., cordials and delicious desserts are here to tempt you. Murphy Rooms: “Murphy” or “King Standard” rooms include a king sized bed that could fold up into the wall. A small sitting area has a love seat and coffee table, a small table with 2 chairs, sink, counter top and a double sink inside a full bathroom. While the room is smaller than the regular rooms, it is offered at a slightly lower nightly rate and is suitable for two adults. 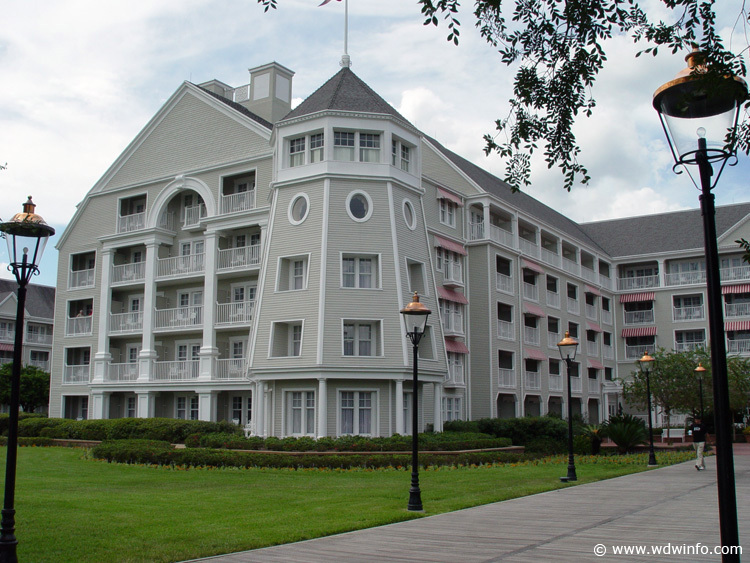 Resort guests have three views available to them at the Yacht Club. The Standard view of some of the guest rooms, is that of the parking lot or wooded areas around the resort. The Garden view is available for concierge level rooms and overlooks nicely landscaped areas such as the quiet pool or the wedding gazebo. Regular guest rooms or concierge level rooms can choose a water view of Crescent Lake. Be aware that in the regular rooms, this water view may not be a direct view. 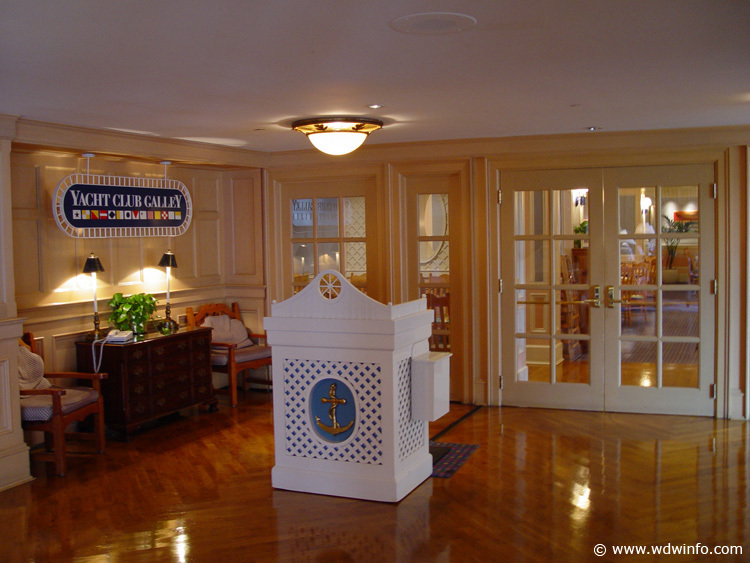 Check-in time at the Yacht Club is 3 p.m. and check-out is 11 a.m.